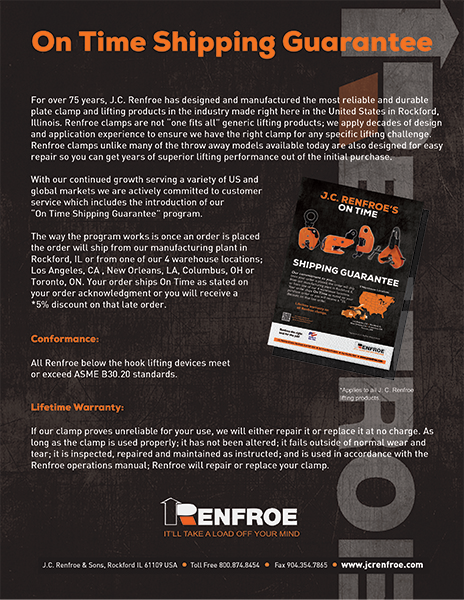 J.C. Renfroe & Sons has been a leader in the manufacturing and marketing of lifting products for over 70 years. Our founder designed the first clamps to meet the rising demand for safer steel handling in shipyards prior to World War II. Thus began J.C. Renfroes commitment to quality and safety. We have grown to become an international company whose reputation continues to be unblemished. The quality and durability of our products and the superior quality of our customer service have earned us a strong and loyal following in the lifting and rigging industry. Each new product we add to our lines must meet exacting standards. These standards are not only met for our new product additions, but are adhered to with ALL our existing products too. Reliability equals safety equals less downtime and more continuous workflow - any place where you need to lift, shift and move big weights. Be assured that all our products have to outperform the specification they were designed to meet; a solid fact that holds firm. That's why it's safe to say Renfroe products last longer.